During the summer months, a wasp infestation can put a damper on your outdoor activities. If you are concerned about stinging insects around your property, you should be on the lookout for the signs of a wasp nest. A company that offers bug extermination services will be able to provide you with targeted spider nest and wasp nest removal. Once you have located the nest, you will be ready to schedule your extermination services. To help you decide whether your home needs bug extermination services, here is a look at 3 signs that there is a wasp nest on your property. One of the top signs that there is a nest on your property is when you start to see large numbers of insects swarming in a particular area. Since wasps must return to the nest to feed their queen and care for their young, they will often be seen leaving their nest repeatedly throughout the day. Following the flight path of the swarming insects may lead you to the location of the nest. If the nest is located above your roofline or in another out-of-the-way location, you may have to rely on sound, rather than sight, to find it. When a group of wasps builds a nest, they will generate an unmistakable buzzing sound. If you are being bothered by buzzing wasps, this is a clear sign that you need to call the exterminator. 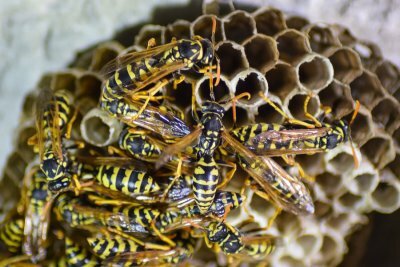 To identify a wasp nest around your home or yard, you can also carefully look around for any visible structures that a colony of wasps may have created. Depending on the species, their nest may be made up of thin, paper-like material or muddy deposits. Certain types of wasps are even known to build their nests deep underground. Once you have spotted the actual nest, you will be ready to start the extermination process. Having issues with wasps on your property? Don’t wait! Call (847) 529-2847 for professional wasp removal today!